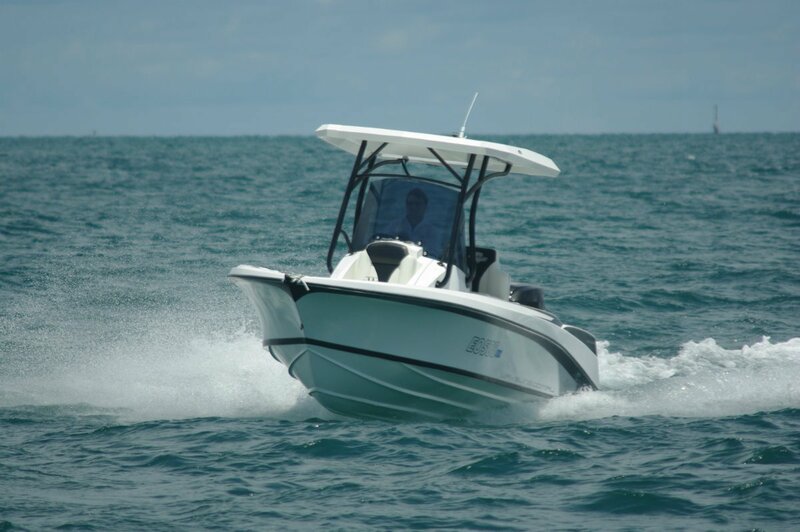 Fibreglass construction in WA has been an endangered species for some time, but now a fresh face has appeared on the scene – Waveline Custom Motor Yachts of Pinjarra. With their first vessel a 5.8m the Motor Yacht in the title might seem a bit ambitious, but there are firm plans to expand the range, and the quality of the initial product is right up there in the motor yacht class. 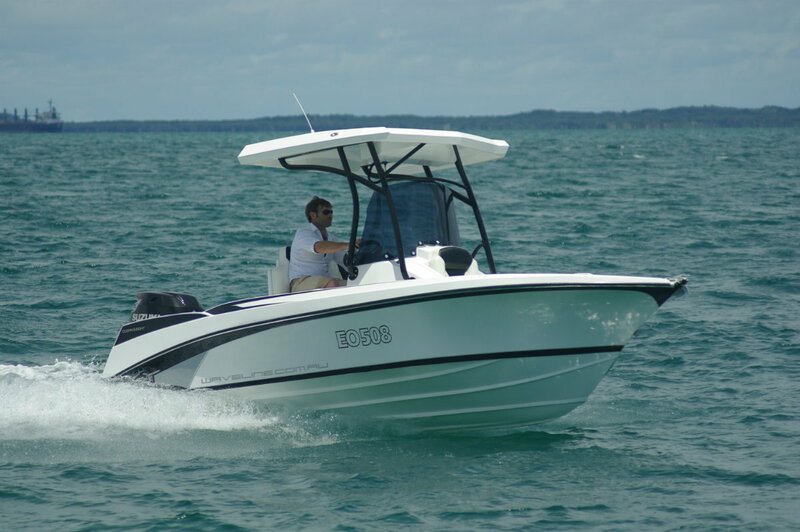 The Ocean 5.8 is a centre console with a distinct wave boarder look, but there is no doubt that ocean work was in the designers mind. The bottom has a 24-deg deadrise with a planing plank modifying the buoyancy, the bow a massive flare, and there are open water quantities of freeboard. We had the day for the hull to prove itself, and that is what it went ahead and did. We travelled at unrealistic speeds over rugged water and were presented with a superior ride and absolute dryness - other than from the odd wave that caught us out of step. The two travelling in first class had an excellent double seat with bolsters for standing, a grab rail and a good protective windscreen. Gas struts lift the seat, which is also the lid to a big icebox. Steerage class has a folding - disappearing, really - rear lounge whose backrest makes a great smooth water seat perched up on the transom. One passenger, whose class probably depends on weather conditions, gets a throne-like chair ahead of the windscreen. This lifts electrically to reveal either storage or a slightly exposed chemical toilet. 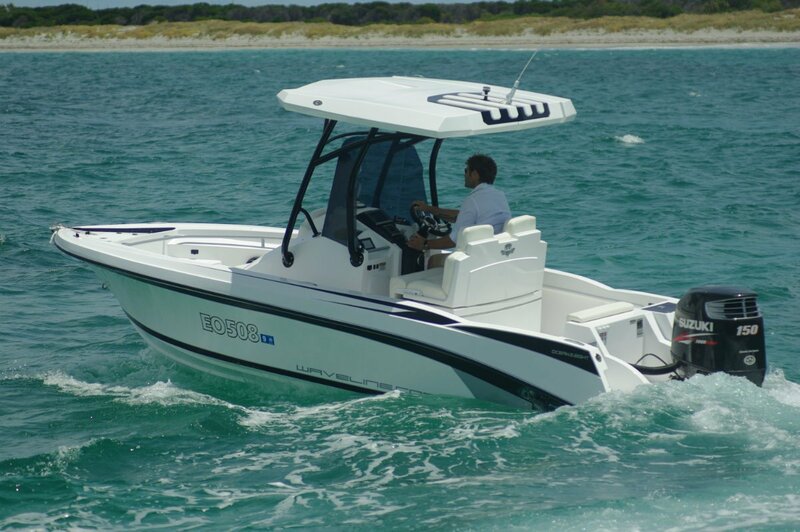 Waveline’s intention with the 5.8 was to produce a highly versatile boat, and its wake board-water skiing looks are more or less justified. There are no tricky ballast pumps or wake making guillotines, but by all means let water into the under deck space to encourage drag. What is clearly catered for with toys to match is fishing. Rod racks within the bulwarks, bait container and tackle drawers are just some of the goodies. The builders emphasise style whatever the sport. The compound and reverse curves and styling cues are well and subtly done, and the piece de resistance has to be the dash. It houses not a single switch or conventional dial, and yet it is all easily understandable, readable and useable. A small touch screen handles everything that would normally need a switch. 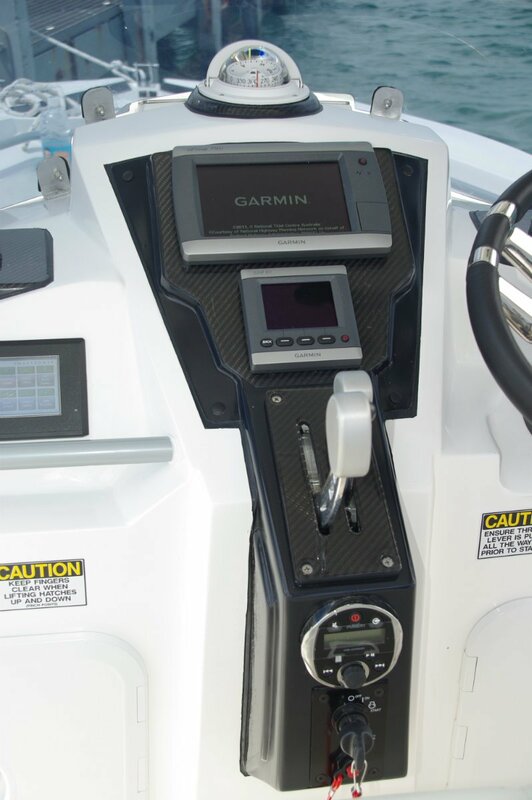 Besides this a small and a larger Garmin screens cope with every other kind of display. And there is little else ahead of the driver: wheel, ignition key, trim buttons and a pair of levers just about sum it up. Radio and stereo live in an overhead console. Twin or single lever controls are a personal preference, but twins have a lot to be said for them. The main advantage in my view is the impossibility of accidentally ripping into reverse when pulling back the throttle, which the new electronic controls make easier to do. Practically everything that could be exclusive to Waveline is. 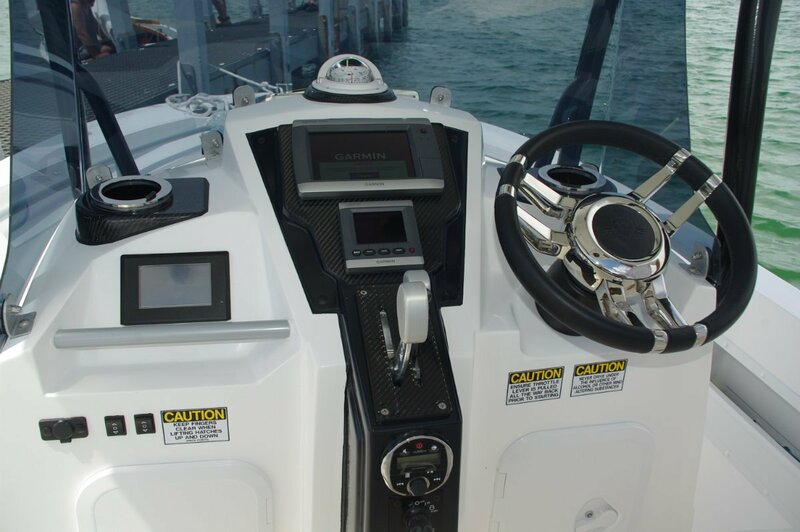 Minor hardware such as fuel and water filler caps and hideaway cleats is either imported from Europe or engraved with the Waveline logo. 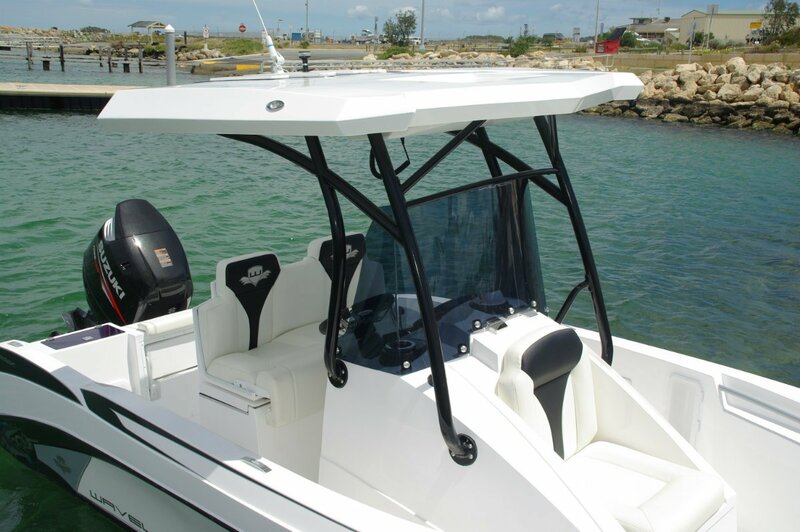 There are six of those cleats; a pair amidships is always useful, a fact ignored by most trailer boat builders. Luxury touches include floor lighting – in fact lighting everywhere – plenty of 12V sockets and monster speakers for the Fusion stereo. This is the most thoroughly documented trailer boat I have been on. 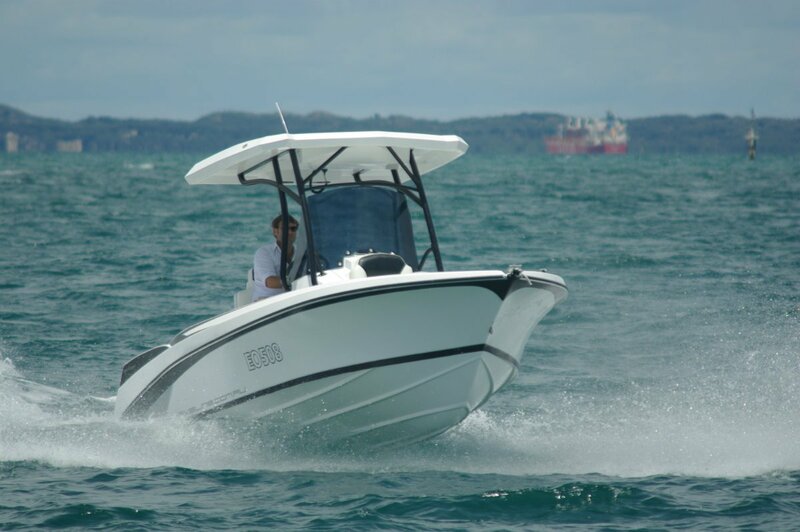 It came complete with the surveyor’s stability report and the detailed results of sea trials with its 150hp Suzuki. These revealed a top speed of 41 knots and a most economic speed of 22 knots; this will give you 178 miles from the 150L tank. This boat deserves to be a winner for its builders. All the style in the world, superbly finished and yet very practical. All for a surprisingly modest $79,990 on a Dunbier trailer.